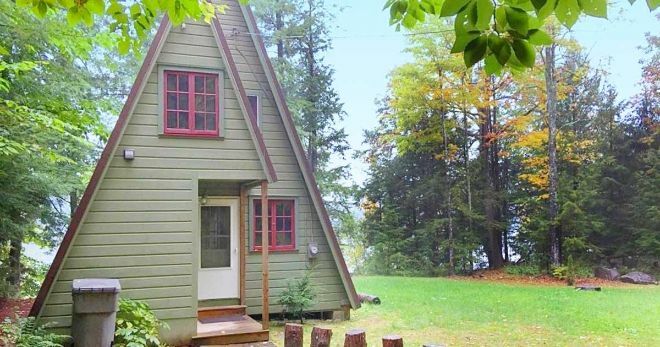 This quirky A-frame cabin is just minutes away from Lake George and Saratoga Springs - but its lakefront location and rustic interior might make you never want to leave. Besides being situated on a picturesque upstate New York lake, this little 560-square-foot cabin boasts a beautiful wood interior, a farmhouse sink, and staggeringly tall ceilings. The outside is just as rustic and picturesque with beautiful green siding that blends in with the surrounding woods, and a tall peaked roof that looks to reach above the treetops. The roof is also a wonderful plum purple color - adding a bit more flair to this little A-frame. Take the tour and see all its charming elements for yourself. This A-frame cabin peaks high like the trees that surround it - looking like a storybook come to life. The inside of the cabin is flanked in natural wood that makes this lofty space feel cozy. We love the giant windows because they not only frame the view, but they let in beautiful natural light that's slipped through the treetops. 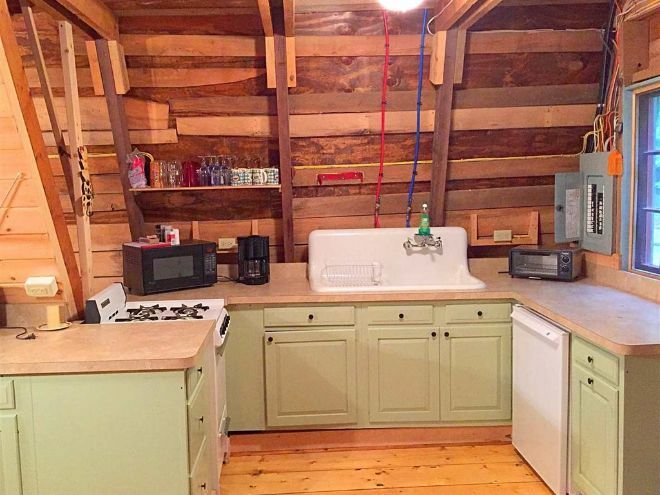 The kitchen is quirky and cute. We adore the green cabinets and the farmhouse sink because they add some country flair to this rustic cabin. 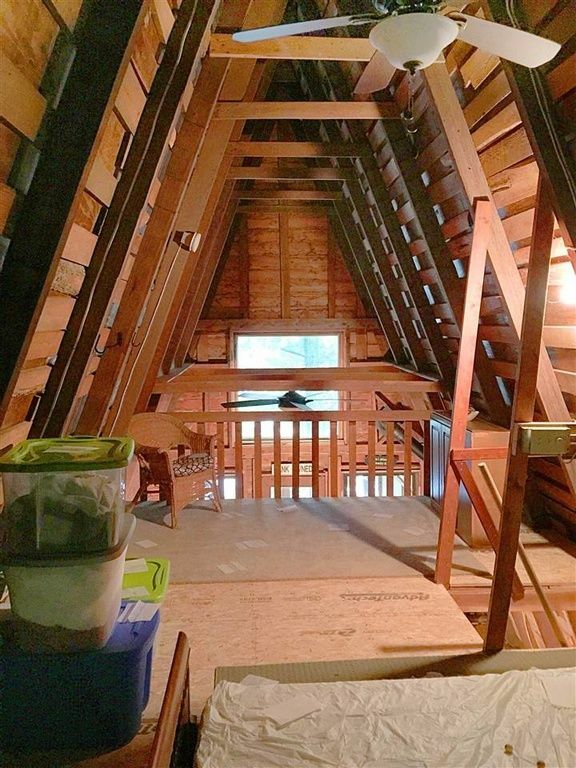 Up in the loft there's plenty of headroom, and a great view down to the quaint little cabin below. We love how from here you can see all the beams above, and how the joists create a literal 'A' in the top of this cabin. Back outside you can really appreciate how tiny, cute, and unique this home is. Besides its funky shape, this cabin has a purple roof! Off the back there's also a screened in porch which is perfect for those cool, buggy evenings. Share this quirky A-frame cabin with your friends on Facebook. A gorgeous retreat located in the High Sierra Nevada Mountains. Designed and built by a French architect, this home is like no other. 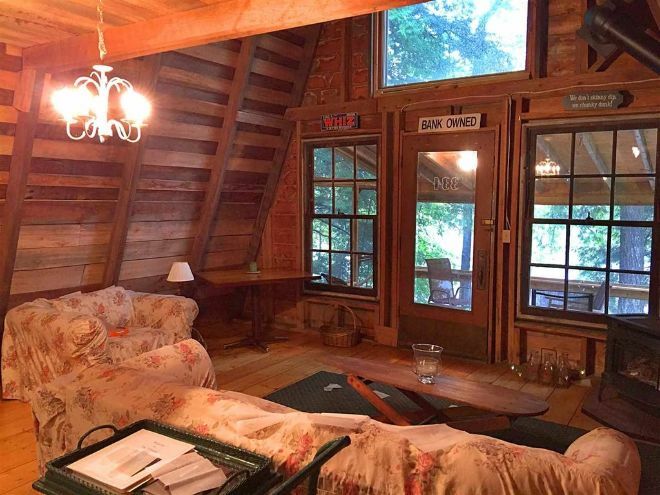 This lovely A-frame cabin in the mountains has everything you'll need, and a wonderfully rustic feel to boot.